Turns up the volume while highlighting the distinct Ecoboost turbo sounds! Increases the fun factor and provides a tastefully aggressive note. Improved exhaust flow increases horsepower and supports future mods. 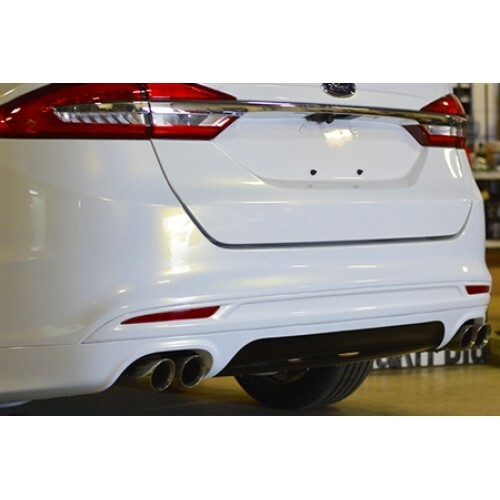 All stainless steel exhaust system is built from 2.5" North American T304 grade material for superior durability. CNC mandrel bent for consistently smooth flow path and precise fit. Lightweight assemblies save 30 lbs, improving all aspects of performance! Quad 3" double wall, polished T304 stainless steel tips with beveled edges add style to your ride. Optional matte-black Cerakote (high temperature exhaust coating) tip finish available. Reduced back pressure boosts fuel economy. Direct fit exhaust for your vehicle: no welding required. NOTE: Requires cutting of factory tubing to remove OEM resonator.